CNNSen. 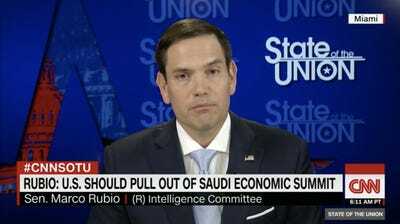 Marco Rubio of Florida appeared on CNN’s ‘State of the Union’ with host Jake Tapper on October 14, 2018. Sen. Marco Rubio promised a “strong congressional response” against Saudi Arabia if the country is found to be responsible for the disappearance of Washington Post columnist Jamal Khashoggi. Rubio’s comments come a day after Trump vowed “severe punishment” for the US ally if they were found responsible. Turkish officials believe Khashoggi, a sharp critic of the Saudi Arabian government, was killed last week inside the Saudi consulate in Istanbul. Saudi officials have denied the allegations. The Saudi Arabian journalist was declared missing last week after he did not emerge from the Saudi consulate in Istanbul after 11 hours. Turkish authorities believe he was killed inside the consulate. Though Trump called the allegations “really terrible and disgusting,” he told reporters on his way to a Kentucky rally Saturday that scrapping arms sales deals would hurt US companies and jobs more than it would punish Saudi Arabia. “We’re just hurting ourselves,” Trump said. Saudi officials have flatly denied the allegation and claimed Khashoggi left the consulate but failed to provide definitive proof.